Having excess moisture problems from concrete can cause multiple issues with your flooring. Installing a vapor barrier above the concrete can help reduce/eliminate your beautiful flooring from buckling or warping from the excess moisture. Since concrete is porous, water vapors transmits from the ground through the concrete slab into your basement. Once the water vapors gather underneath your flooring, it will start to pool up and “soak” into your hardwood flooring. Once this happens, the flooring can buckle or warp and cause havoc. With a 6 mil vapor barrier underneath your flooring, the water vapor will gather underneath the film and no longer reach your beautiful flooring. No more worrying if your floor will have issues. Our MoistureBlock is a 6 mil polyethylene film vapor barrier that is used during the installation process with floating laminate and engineered wood floors. No need to bother with large fold-out, low quality, off-spec, construction grade films, which can be bothersome and hard to use before the floor is installed. Always read the flooring manufacturers recommendations and instructions before installing the underlayment. Before rolling out the underlayment, be sure to sweep, vacuum, and remove all debris on the substructure. Fill in any significant holes, gaps or breaks that may exist on the substructure. Roll out the Underlayment over the substructure surface. Leave roughly 2-3 inches along each side to overlap against the wall. the water vapor transmission ratings suggested by the flooring manufacturer. liner from the tape and adhere to the edge of the previous roll. the adjoining rolls of film. 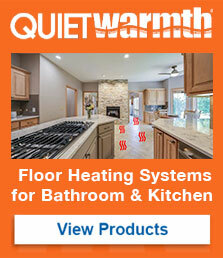 PreviousPrevious post:Installing Heated Floors Under TileNextNext post:Does Vinyl Plank Flooring Need Underlayment?